Q4 2018 Letter | Nicholas Hoffman & Co.
returns across nearly all asset classes. U.S. stocks, international stocks, and emerging market stocks were all up more than 20% in 2017 with emerging markets outperforming U.S. stocks by more than 15%. 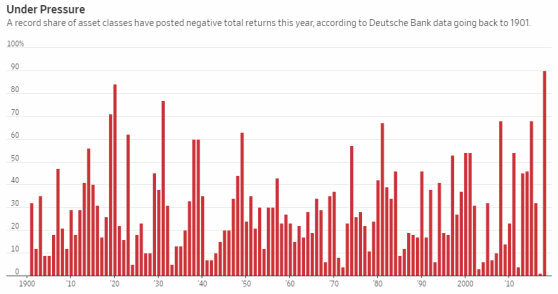 All this with the least market volatility seen since 1965. In 2018, the story couldn’t have been more different. Of the 105 fund categories tracked by Morningstar, only short-term bonds/loans, municipals, and utilities finished the year with positive returns, and those were in the low single digits. U.S. stocks declined -4.4%, developed international stocks returned -13.4%, and emerging market stocks were off -14.6%. Scanning the list of 14 country-focused ETFs we track, all experienced negative returns with 10 down -12% or more on the year. In the public markets, at least, it was a challenging year to find winning investments. uncertainty over trade policy, geopolitical uncertainty, tightening monetary policy, and concerns about slowing global growth, especially in China, the world’s second largest economy and ground zero for trade tensions. In general, markets dislike uncertainty and there has certainly been plenty to go around. Markets are forward looking, and the forward outlook has not been as positive as it was a year ago. Markets also tend to overreact on occasion, advancing too exuberantly on good news, and declining too vigorously on bad news. Taken together, it adds up to an environment where volatility is likely to be with us for a while. We understand volatility can be uncomfortable, especially when it is so widespread. In times like these it is useful to remember that comfort and opportunity do not usually go hand in hand. When the level of comfort is low, the level of opportunity can be quite high. The old Wall Street saying “markets climb a wall of worry” comes to mind. In this sense, a return to more normal levels of volatility in the markets and a widening recognition of risk among investors could be a very healthy development. A little fear and skepticism helps keep markets in check and can provide opportunities for patient investors. Market leadership changes, sometimes rapidly; what had been the darling of the past becomes today’s fading star. In the turbulence of the last quarter, we have begun to see what may be the early stages of a reversal in several trends that had been driving the markets in recent periods. For example, in the last two months of the quarter, developed international stocks outperformed the S&P 500 by a modest 1.8% while emerging market stocks outperformed the S&P 500 by 8.8%. We’ve seen previously high-flying technology stocks begin to underperform the broader market and more defensive sectors like utilities and consumer staples perform more favorably than the broader market. We’ve also seen high yield credit spreads widen considerably as investors have demanded more yield for assuming the risk of default. This could be the beginning of a shift towards a new environment. As the markets rotate and become more difficult, the management of capital can change as new opportunities appear. Two areas where we have been active recently are tax loss harvesting and cash management. Where advantageous, we have completed trades to recognize tax losses and avoid taxable gains distributions, all while maintaining proper diversification and being mindful of wash sale rules. We executed more trades this December than in any previous month in our firm’s history. On the cash management front, we have been actively trading accounts to increase the return on our clients’ cash and short-term holdings. During a year where the Federal Reserve raised short-term interest rates four times, we saw the opportunity to improve returns on excess cash by investing in short-term US Treasury Bills and money market funds. Short-term Treasuries are currently yielding 2.37% annualized and their interest is not subject to state or local taxes. This amounts to a 2.52% tax equivalent yield with (what might be considered) no credit risk for a taxable investor. We can execute these trades commission free at Schwab. Firmwide, we are currently trading more than $70 million per month in short-term Treasuries. We remain committed to our focus on long-term strategic thinking, careful cash flow planning, being vigilant about taxes, fees, and expenses, and identifying opportunities in the less efficient and less correlated private markets. These are the areas where we strive to consistently add value over time, no matter what short-term gyrations may occur in the broader markets. We are very pleased to announce Whitney Butler has joined the team in the role of Family Office Associate. Whitney holds a bachelor’s degree in economics from Furman University and her work will include the further development of our financial planning capabilities. As always, we welcome your thoughts, and appreciate the confidence you have placed in our firm. We are grateful for the opportunity to work with you and your family. This entry was posted in Uncategorized on January 24, 2019 by nhoffmanandco.